Today I would like to talk about a type of deck that is dear to my heart. The white-weenie archetype. I played a lot with Oketra’s Monument in the last Gentry format (and even a small venture in Standard), so naturally when Guilds of Ravnica was fully spoiled I set on trying to build a new version. 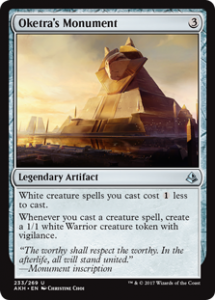 Sadly, Oketra’s Monument is no longer legal, but cards like Adanto Vanguard and Legion Conquistador have survived the rotation. We also got a functional reprint of Dawnfeather Eagle so I was all set to start brewing with these cards in mind. Granted, I’ve had some very lucky draws at times. But the deck felt strong and well suited to go under the control decks. Mono-red also felt really favorable because they can play only 1 Goblin Chainwhirler, and you have a built-in life gain package. 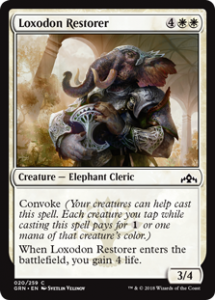 Not to mention you can play 4 Loxodon Restorer in the sideboard, which is just a beast (Elephant) against the red decks. Against the midrange decks, I look to use Legion Conquistador and Adanto Vanguard to maintain my board presence and hope to grind them out of their removal spells. I’ve also noticed a big advantage against the 3-color decks. With most of their lands coming into played tapped, that gave me a big window to deploy my pocket army and overwhelm them on the board. I’m writing this on the Monday after the Pro Tour, and no less than 6 white weenie decks made the top 8! Seeing such a dominance of 1 archetype strengthens my belief that the weenie decks is also a strong choice in Gentry going forward. Of course, you have to rebuild the decks to make them Gentry-viable, but that’s what this article is for! I mentioned that there is a little life-gain package in this deck, and Ajani’s Pridemate is the payoff. Be mindful that each creature with lifelink dealing combat damage causes a separate life-gaining event. For example, if two creatures you control with lifelink deal combat damage at the same time, Ajani’s Pridemate will trigger twice. Dropping the Hawk on turn 1 is easily the best-case scenario. Over the course of a game it will deal about 4-5 damage and gain you the same amount, and it gets even better if you can follow it up with a turn 2 Ajani’s Pridemate. 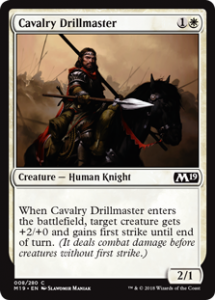 I also don’t mind following it up with Cavalry Drillmaster and attack with a 3/1 flying lifelinker on turn 2. That being said, the card does make your deck weaker against sideboard cards like Radiating Lightning and Mephitic Vapors. If this becomes too much of an issue, I can see replacing the card for Rustwing Falcon and dropping the Ajani’s Pridemate package. While not quite being Wild Nacatl, this can easily be a 2/2 for 1 mana, and the triggered ability helps to grow your Ajani’s Pridemates. It’s a rather unique effect in the deck, so don’t forget to trigger the Vanguard even when you just played it. The +1/+1 won’t matter but you will gain 1 life either way. Now this card has more of a resemblance to the iconic Wild Nacatl, albeit you won’t be attacking with this on turn 2. Even though it will only become a 3/3 on turn 4 or 5, this card has surprised me time and time again. Up to the point where I finally set all my differences aside and include the full playset. You do get to ascend rather quick with this deck, and once you’re at that point you can start attacking with it. Having a 0/3 in the early turns also isn’t the worst that could happen to you, it survives Shock and is actually a decent blocker in the mirror match and against mono-red, where most of their creatures have 2 power. 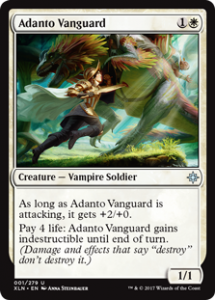 Good old indestructible Adanto Vanguard. I’ve been playing this card for a long time and I’m happy its finally getting some time to shine in the spotlights. A 3/1 attacker for 2 is already fine, but the activated ability makes it really hard to kill. It’s especially backbreaking against the various controldecks, because they don’t have a clean way to kill it, apart from a well-timed Seal Away. Apart from that, the life-gain package you have makes paying the 4 life a little easier. Black Control decks were a lot better at dealing with the vanguard but that does not seem to be as popular anymore. Do be mindful of the role you’re playing in each specific game, there a times when it’s the best choice to just let the Vanguard trade for 1 of their guys. One thing I’d like to note is that the card synergizes poorly with Mentor. The card is worded in such a way that the +2/+0 is not a triggered ability but a static ability. If you would target it with a Mentor creature it’s already a 3/1 instead of a 1/1, so you won’t get the Mentor trigger. Magic’s Play Design team didn’t put full input on Ixalan (they started full input with Dominaria), so it’s possible that R&D just missed this future interaction when designing Ixalan. The Drillmaster is the perfect common for this type of deck. The +2 and first strike allows you to break through roadblocks and after that it leaves a body behind. It’s essentially a combat trick and a creature in 1. It does only have 1 toughness, so together with the Hawk it dies very easily and makes your deck quite weak against the aforementioned sideboard cards. You don’t really mind if it dies to a removal spell or trades with a creature though, since you’ve already gotten the effect. The standard version of this deck gets to play 4 History of Benalia. Sadly we don’t get that luxury in Gentry so we have to look for other options. Legion Conquistador allows the deck to reload after its initial burst, and it also gives you enough permanents s to reach the City’s Blessing. Granted, a 2/2 for 3 mana doesn’t seem like the best deal. But If you read it is a 2/2 for 3 mana that draws you 3 cards suddenly that doesn’t sound so bad. There is the worst case scenario of drawing copy number 2, 3 and 4 in your first draw steps. But I’ve been playing this card for a long time, and it rarely comes up. Dawnfeather Eagle was a common, and now they made the exact same card, also at common! I believe I was one of the few people who got very excited upon first seeing this card in M19. It does cost 5 mana so including this card in your deck means playing more lands. I chose to go with 22, that’s the same number I used in earlier versions of this deck, with 3 copies of Dawnfeather Eagle. I do need to note that the earlier version also played 4 Oketra’s Monument so you could sometimes cast it for 4 mana. Time will tell if I need to add a land or not to consistently cast this card. Now, let’s examine what the card exactly does. It gives your entire team +1/+1 and vigilance. The vigilance is especially important because all your attackers can block the turn after, allowing you to make an all-out attack without fearing to die on the back swing. Also, you’re left with a 3/3 flying creature. After the initial attack you’re not always getting your opponent dead right away. Letting the Angel chip in a few times in the air might be enough to seal the deal. The version before rotation played 2 Cast Out and that worked out very good. I chose to keep that formula and just add the new version of Cast Out. It’s doesn’t have cycling but Convoke means you can cast it even when you’re stuck on mana. I like having 2 main-deck answers against basically everything and this card is best-suited for that. I could see going to 3 copies, but for now I’m trying 1 Pride of Conquerors as sort of a silver bullet. Sometimes it hurts to tap your attackers to convoke this card, because most of the times it will clear away a blocker. But it does allow you to double-spell a lot easier. It’s also a permanent that remains on the battlefield, so getting to the City’s Blessing is also a little bit easier. That’s one of the biggest reason why I would want 3 of them. Like I said in the above, this is just a silver bullet in the deck to “get them” on an all-out attack. It can also be used defensively, but you’re much happier when you can cast this on offense. I’m not including more copies because the deck isn’t as all-in as the decks on the Pro Tour, those sometimes played 20 1-drops so you’re getting to Ascend in no time and then this card can deliver huge chunks of damage. The Gentry version, however is a little bit slower. With cards like Legion Conquistador and Angel of the Dawn giving you a slightly more stable game plan. I can see another version of this deck with 4 Pride of Conquerors and a lot more 1-drops, but that’s for another article. At the moment, I’m liking this configuration and am planning to keep it like this in the future. I’ve been switching the rares in this deck a lot, but this one never came out. It might seem a little innocuous at first sight but this little enchantment does basically everything the deck wants. It produces 2 permanents when it comes into play to help you Ascend faster. 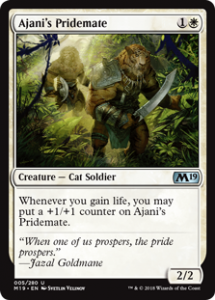 The creature token it makes has Lifelink, which will make Ajani’s Pridemate big, and when you get to flip it into Adanto, The First Fort you have basically ramped yourself to your Angel of the Dawn and have a never ending stream of tokens to follow it up. A natural inclusion in a deck like this. Making all your creatures just a little bit bigger is everything you want in a card. Getting a 3/3 body on top is just a bonus. 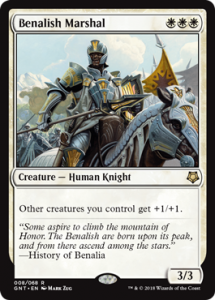 If Gentry wasn’t limiting you to 4 unique rares and/or mythics I would happily play 4 Benalish Marshal as my rares of choice. Another way to pump your team, although it can be a bit awkward to tap all your creatures to get the full effect. But at least you get a 4/4 blocker when you’re lowering your defenses for a turn. Ideally you want to convoke it for 5 to get the maximum effect. This one actually has the least synergy in this deck, but it’s the most powerful rare on its own. 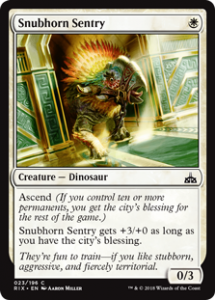 Chapter 3 will rarely pump any other creatures though ( the deck is mostly playing Soldiers instead of Knights oddly enough) but still, getting 3 permanents out of 1 card has some synergy with your Snubhorn Sentrys. This comes in against any deck with creatures and it’s especially interesting in the mirror match and the Izzet Drakes match-up. Being able to snipe one of their Enigma Drakes or Crackling Drakes is big game. Make sure you play around Spell Pierce and keep your fingers crossed they don’t have Dive Down. This card is here primarily for the mono-red match-up, but I can see siding some copies in when I feel like I need some bigger creatures and/or have to buffer my life total a bit more. Interestingly, siding this in makes your Ajani’s Pridemate even better. Ok, so suddenly I have about 11 cards I want to side in vs Mono Red. The life-gain clause is relevant and being able to snipe their Flame of Keld is really insane. Apart from that, I would never leave home without some sideboard cards to destroy artifacts and enchantments. It can be useful in any given match-up. This card replaces Adanto Vanguard against the more aggressive decks. (I’m gonna mention Mono Red one last time, I promise). But also its useful against decks with more removal as a supplement to Adanto Vanguard. That being said, it’s just a 2/1 for 2 mana so I would not play this card in the maindeck. Extra note is that the token you get also has lifelink, which has some good synergy with Ajani’s Pridemate.